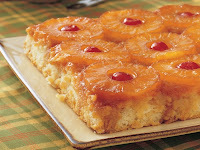 Last week I experimented with a pineapple upside-down coffee cake. It turned out great! My husband tore it up! I surprised myself with how well it turned out. I made it from scratch! One of the ministers who preached at my church actually used the cake as an illustration in his sermon. Not my cake, but the kind of cake. It was a pure coincidence. It had to be God speaking to me—telling me that I’m doing a good thing learning how to cook for my family and that He’s with me and everything’s going to be OK.
Who knew that “upside down” would be the theme for this week? My life could be turned upside down. I have a breast biopsy scheduled this week. Shortly after K was born I felt a small lump in my breast while breastfeeding. Although my doctor keeps reassuring me that the lump is probably due to breastfeeding, I can’t help but think what if. And for those extra spiritual Christians, I’m not claiming anything. But when you’re met with a speed bump in life, you can’t help but reflect on the “what ifs”. What if my life is turned upside down with a serious illness? I just had a baby. How could I go through the turmoil of a serious illness with a little one to care for? What if I’m not provided the opportunity to raise this precious little boy? If I hadn’t turned my thoughts to Christ, I would be insane right now. But, I’ve kept my mind stayed on Jesus and he’s held up his end of the deal. He’s given me perfect peace. However, I am battling my fleshly thoughts of doom and gloom. I’m struggling to maintain that peace. I have been thinking about those mothers who have received a negative diagnosis. My prayers go out to them. What would I do in the same situation? Could I be as strong? Would my faith be shaken? I think about the turmoil that my DH goes through without his father. I don’t want K to go through the same thing missing a parent. It’s an emotional rollercoaster. In response, the Lord keeps reassuring me. He gave me some reassurance on Sunday. The choir sang “Because He Lives” and verse 2 greatly ministered to me. The Lord reminded me that no matter what circumstance we face, my son and I can face tomorrow because He lives! What a sweet reminder. This is the kind of assurance that God wants all parents to have whether we’re around to watch our children grow up or not. As believers, we have to have faith that the Lord will take care of our children just as He’s taken care of us. He’s our Heavenly Father. He’s the ultimate Mother. Whether we’re present or not, God will take care of our children. Personally, I know that God is using this biopsy as a teachable moment. God wants me to learn how to enter into his rest. Will I allow fear to take control of my mind or will I have faith? Hebrews 4:9-11 (KJV) says, “There remaineth therefore a rest to the people of God. For he that is entered into his rest, he also hath ceased from his own works, as God did from his. Let us labour therefore to enter into that rest, lest any man fall after the same example of unbelief.” I do not want to be like the children of Israel–going around the same mountain for 40 years. I’m trying to learn the lesson now. I’m going to labor to rest in the Lord no matter what circumstances life brings. This is extremely important to me because this is a lesson that I want to teach my son and we all know that merely speaking the words will not convey this message to him. I have to model it. I hear you Lord! And, I’m submitting myself to the Holy Spirit on this one.